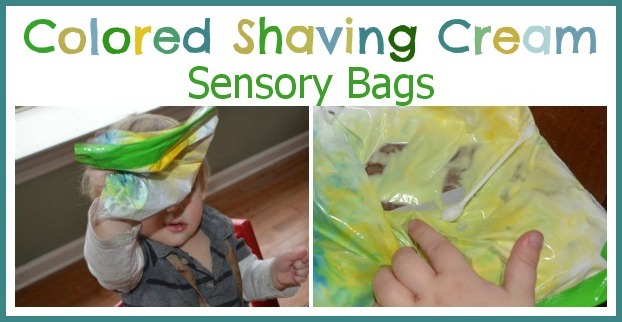 Babies and toddlers love playing with these mess-free shaving cream sensory bags. I put together a shaving cream sensory bag for my baby to play with color. Using sensory bags helps develop fine motor skills, as the children create patterns in the cream. It also is a fun way to get a mess-free sensory experience! Add the white foam shaving cream into a re-sealable bag, and put in a few drops of food coloring (more drops leads to a stronger color). This time we used blue and yellow drops. The blue and yellow mixed with the white shaving cream, and also with each other, so my son could see the two colors combining to form green. As an optional step, to make sure the bag doesn’t burst seal it with duct tape. I handed the bag to my son, and he pounded it, tossed it, and rubbed his fingers around the bag, mixing the colors as he played. I also gave him q-tips, to make designs in the shaving cream. I’ve done this with my older son before, but this was my little guy’s first time. It was so much fun, I know we’ll be repeating it! For another shaving cream sensory bag, check out our glowing bag!